A slider isn't just a mini burger. It's cooked in a whole different way which makes it extra juicy and tastier than it's larger counterpart. Something I learned last night when me and my family decided to have dinner at Slammin'. That, and how you're not supposed to judge a resto by its size and appearance. I've probably walked by Slammin' in Greenhills Promenade more than a handful of times but never bothered entering because I thought it was a regular fast food joint selling mass-produced burgers straight off some factory's conveyer belt. This is their cooking area. A space no larger than a single square meter. Efficient but a bit too small for the scale of orders they receive if you ask me. We visited around dinner time and had to wait pretty long for our food considering it was just burgers and fries. I think it took about 15 minutes or so before we finally got to eat. Unfortunately, a large take out order was placed a few minutes before we arrived and given the scale of their operations, the cook was unable to prepare our food simultaneously. They definitely need a larger cooking area because like I mentioned in the beginning of this post, Sliders are cooked a different way, they take slightly longer to prepare due to the "steaming process". 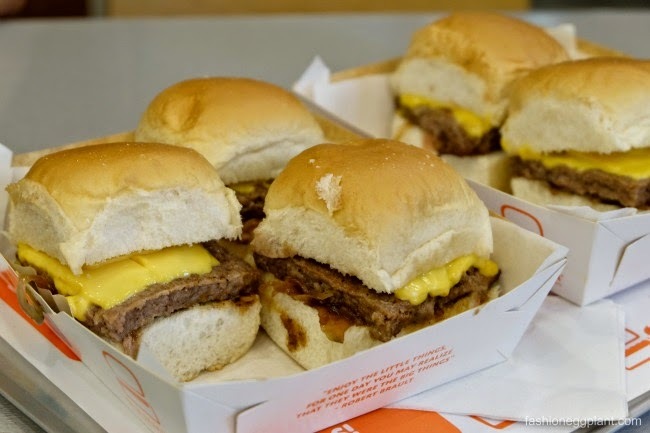 Unlike regular burgers which are quickly fried or grilled, sliders are steamed and layered with the onions at the bottom, followed by the beef patty, cheese, top bun and bottom bun. They are covered with a melting dome which allows all the flavors to harmoniously blend and seep in together to create a super juicy beef patty and buns that are soft as pillows. Me and Dennis both had the All- American Sliders (P145, double/P215, triple - beef patties with steam grilled onions, melted cheese). I ordered the Slammin' Cheese (double - P125) for Nikola because she prefers her burgers simple with just cheese. For sides, we went for the Beefy Supreme loaded fries (P125 - ground chuck, roasted garlic, cheese sauce, tomatoes, sauteed onion rings). The burgers surpassed my expectations. They were extremely juicy, beefy and tasty. Definitely the best I've ever tried at this price range and even better than some of the more expensive ones I've tried around the Metro. The buns had a slightly sweet flavor + super soft and fluffy texture which offered a nice contrast against the beef patty. Another nice surprise was their home-brewed iced tea. Not too sweet, just right. Exactly the way a good old-fashioned iced tea should taste. Beefy Supreme Loaded Fries - Out of everything I sampled, I found these the most disappointing although not entirely all that bad. It doesn't say in the description but it tastes like it had mayo on it too. I am really not a fan of mayo as a topping. I find it too rich and sweet so I'll probably have their Fries In A Cone with Dip instead on my next visit. Visit Slammin' Mini Burgers + Fries + Dip at the ground floor of the new wing of Promenade Greenhills, Trinoma's Food Choices Level 2, 5th Floor Market! Market! and soon at Robinsons Magnolia.